Llanberis doubled as the Khyber Pass for the "3rd Foot and Mouth"
A plaque has been unveiled in Snowdonia to mark the spot where the classic comedy Carry On Up The Khyber was filmed in 1968. The Watkin Path that leads to the summit of Snowdon doubled for the historic outpost of the empire. Angela Douglas, who played Princess Jelhi, unveiled the tribute to the film, the 16th in the pun-laden series. The film is being honoured as part of the North Wales Film and Television Trail, run by Wales Screen Commission. The comedy, one of a string of low-budget classics, had funding for only 10 days filming in Snowdonia, rather than in the Hindu Kush. Douglas, who had just married her actor husband Kenneth More, who was a huge star at the time, said he she had fond memories of project, which was also her first visit to Wales. She said: "The films just hit the nation's funny bone and perhaps it was obvious we all got on so well and our joy of being together was infectious. "But we were all so shockingly badly paid that it's embarrassing that people think we were rich." She added that she remembered fondly the film's dinner scene, where characters ate while "shells" crashed round them. Douglas said: "There isn't one shot of me in close up because I couldn't stop laughing." The film commission has also given a version of the plaque to Peter Rogers, one of the people behind the Carry On production, along with Gerald Thomas. Film buffs claim that the mythology surrounding Carry On Up The Khyber includes claims of its actors later being buttonholed by Indian restaurant waiters thanking them for showing their "homeland" on the screen. The commission's research for the plaque also found another story about the film. Princess Margaret, who visited the set, was said to be "incandescent" at the "disrespect" shown to her great-great grandmother, Queen Victoria, who in one scene was referred to as "Queen Vicky". 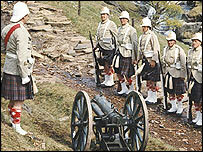 A little known fact about Carry On Up The Khyber is that the soldiers' costumes were borrowed from 1964 war classic, Zulu, which recounted the battle of Rorke's Drift, one of the most famous episodes in Welsh military history.